Desiree Curtis, left, was with her daughter Julianne Fisher at Beacon Hill Chocolates on the lookout for a few treats. My approach to Valentine’s Day chocolate has always been pretty straightforward. I stop at trusty Phillips Candy House after work, pick up a dozen dark-chocolate turtles — the ones with a little salt on top are responsible for at least 1 percent of my body fat — and drive home. After all, nothing says “I love you” like ample parking right near your office. But I’m in Valentine’s debt. A year ago, when the most romantic of fake holidays fell on a Sunday, my nine-months-pregnant wife and I were packing our bags for the hospital. My best Valentine’s Day move is a fancy dinner out, but apparently severe dietary restrictions and a small human protruding awkwardly from your midsection don’t lend themselves to a three-hour tasting menu at Menton. Instead, we ate all the food left in the fridge and got the last good night’s sleep we’ll ever have. So this year, I decided to escalate the heart-shaped battle. Though I will never forsake Phillips, I decided to find something different — a fresh, local, cutting-edge chocolate experience worthy of the best valentine a guy could hope for. I started my search, as any man with more than three neckties and a history of things to apologize for should, at L.A. Burdick. Around here, “Burdick’s” seems to be synonymous with fancy chocolate. Two elegant little shops, one in Back Bay and another in Harvard Square, sell creations from the Walpole, N.H., mothership (I’m counting Walpole as local because skipping Burdick’s on a technicality would be absurd). I waltzed into the Cambridge location one Friday night and was surrounded by tiny, delicate bonbons, including their signature mouse and penguin; beautifully packaged bars including house-blended and single-origin chocolate from around the world; and elaborate collections in wooden cases, sealed with wax and ribbon. You pay for the luxury. The “large wood assortment” will run you $74. 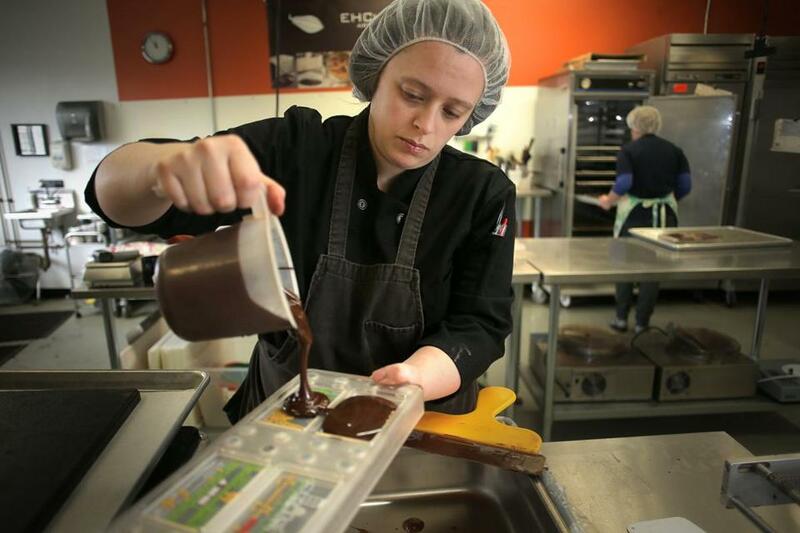 Ariel Gabriel poured chocolate into molds at EHChocolatier in Somerville. There were a half-dozen of us packed into a few square feet of unencumbered floor space. And in the middle of the room, a stylish young couple — her: green hair, him: child’s backpack and fur-lined hood — was full-on making out. Several tourists stared at the floor and tried to disappear into the rows of $13 chocolate bars. But I took this to be a good sign: These chocolates work! I picked out a few to bring home. The rodent and the flightless bird, naturally, along with a $13 chocolate bar from Grenada, which I’m almost certain is still a country. So what’s a $13 chocolate bar like? I will spare you the tasting notes — you could write nearly anything on the wrapper and my brain would convince me I was detecting, say, hints of rich mahogany and leather-bound books, the flavor equivalent of Ron Burgundy’s apartment. But there was indeed a complexity and depth you won’t find in even a high-end supermarket bar — you know, the ones they keep separate from the Goobers and whatnot. And the bonbons, though almost too small, accentuated interesting flavors without overpowering the rich chocolate. It’s good stuff, to be sure. But there’s a whole world of cacao out there — I always crack up when people say “cacao,” I can’t help it — and I intended to try all of it. I set out to see what brown could really do for me. If elegance is your goal, it would be hard to beat Beacon Hill Chocolates on Charles Street. Rows and cases of pristine confections fill every square inch. Service could not be friendlier. And owner Paula Barth finds perfect, handmade chocolates from far and wide to pack into beautiful boxes, some painted by hand. This is the height of high-end chocolate shopping. But — and this is no knock — there’s something to be said for local craftsmanship, too. “It’s hard to find places that make the chocolate there,” said Lee Napoli, who teaches classes in chocolate making and once ran the highly regarded retail operation ChocoLee. 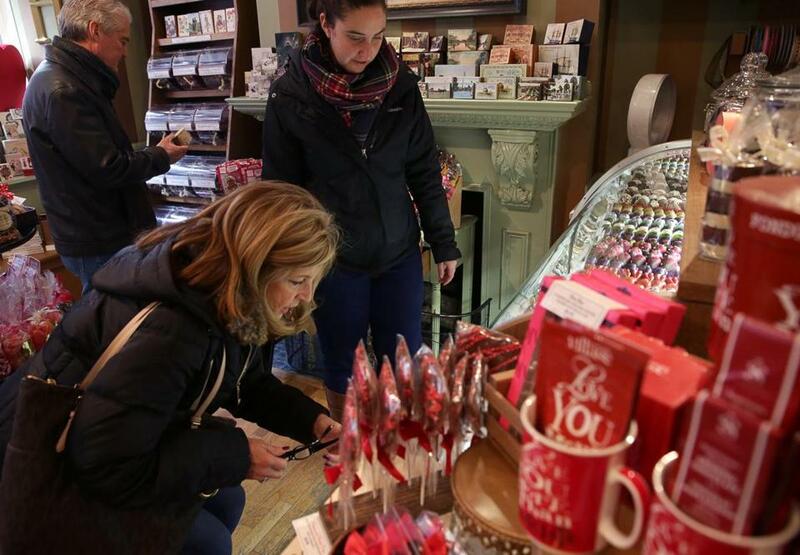 Napoli said she’d heard good things about Serenade Chocolatier in Brookline Village. It’s a pleasant little storefront operation, with a well-stocked display case and many pre-packaged options. Along with a wide range of bonbons, including exquisitely detailed fruit and champagne truffles and caramels big and chewy enough to evoke and improve upon old-fashioned drug store assortments, Serenade makes a killer Viennese truffle — a three-layered square of rich chocolate with a rustic fudge-like quality. If you’re shopping for a valentine with traditionalist tendencies but a taste for some experimentation, this could be the place. I was particularly partial to a coffee cream, with a thin shell of beautifully molded dark chocolate holding a rich burst of cream that could have passed for melted, shelf-stable coffee ice cream. “They say the mark of a fine piece of chocolate is a thin chocolate coating with lots of filling inside,” Napoli said. Check. Chocolate bars at Somerville Chocolate. But what about the melting edge of chocolate innovation? For that, I checked out Somerville Chocolate, which runs a “bean-to-bar” operation out of the building where Aeronaut Brewing makes beer. 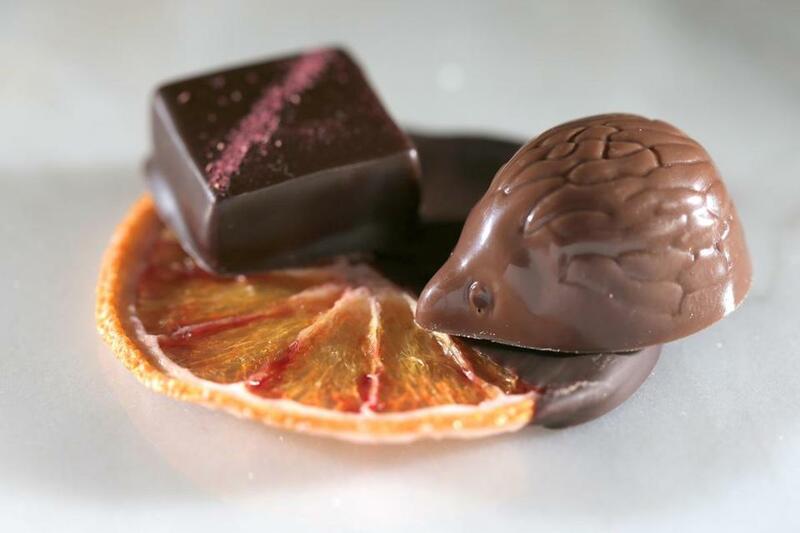 And another chocolatier, Alexandra Whisnant’s gâté comme des filles, has taken up residence inside part of the Somerville Chocolate Kitchen there. Whisnant, a Boston native who honed her chocolate-making craft in Paris before returning recently, is selling her painstakingly crafted, too-beautiful-to-eat chocolates inside Lizzy’s Ice Cream on Church Street off Harvard Square through February, along with the space at Aeronaut and in a handful of retail shops. When I stopped in at Lizzy’s last week — undercover in my remarkably lifelike “doughy dad from Quincy” disguise — I was very cheerfully warned that anything I bought that night would be out of date by Valentine’s Day. As with anything perishable, freshness is key. Napoli’s words echoed in my head: “If you’re buying it from a chocolatier who makes it fresh, you want to get it as close to Valentine’s Day as possible,” she’d said. I made up some nonsense excuse and picked up four stunning chocolates at a shudder-inducing $5 apiece, including the vanilla cream against which all vanilla-flavored items will henceforth be measured and a Wigle Whiskey truffle, coated in cocoa powder, that was so intense I would have had to pull over for an hour if I’d eaten it in the car on the way home. 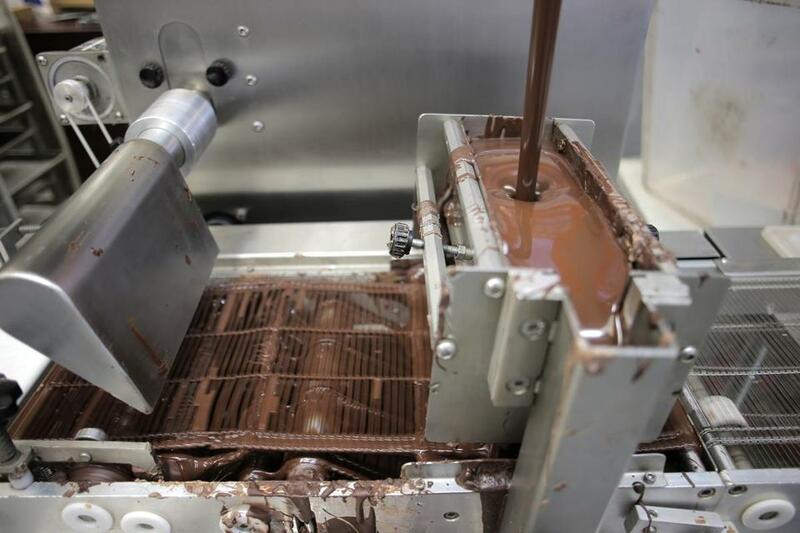 A conveyor carried chocolates under a flow of chocolate at EHChocolatier in Somerville. But the area’s best-known bean-to-bar operation is likely Taza. Founded in 2005 and focused on ethically sourced, minimally processed chocolate, Taza is for sale at specialty shops all over town — I once bought some while picking up a bottle of bourbon — and at a fun retail space in the Public Market. For the full experience, though, hit up the factory store in a section of Somerville that’s been given over almost entirely to junked car lots and probably rat colonies. From inside the shop, you can watch workers toiling away at bean-to-bar business. They probably say “cacao” a lot. But while the results are certainly interesting — authentic stone-ground chocolate is significantly different from your standard issue Ghirardelli bar — I wasn’t sure this was the right choice for me. Your valentine may vary, but my particular special someone happens not to be looking for an Interesting Food Experience when the heart-shaped box makes an appearance. Many of Taza’s bars and discs, sold two to a puck-shaped package, are intensely chocolatey but slightly gritty. “They use a very old-fashioned way of making the chocolate, so it’s not as creamy,” Napoli explained. You also won’t find anything that resembles a traditional assortment here. If your valentine might be into a bouquet of bars of varying origin and intensity, this could be your spot. Otherwise, head upstairs. Little did I know, the chocolate I’d been looking for was directly above me. In the same building as Taza, a handful of women are making what may be the finest chocolates in the country. A selection of treats at EHChocolatier in Somerville. To get to EHChocolatier, follow the small orange signs upstairs from the main lobby, through a set of industrial double doors. You’ll find yourself in the middle of a small chocolate operation with a glass case, a few pictures on the wall, and women working machines and molds. If you can find the place, everyone working away inside will be happy to see you. Otherwise, you can buy their confections at locations around the Boston area or online. And for the next week or so, you can pick them up at a Kendall Square pop-up store. Most of their retail sales are online, co-owner Elaine Hsieh said in an e-mail, though you can find their products occasionally at special markets. When I wandered into the kitchen unannounced, everybody seemed happy to have a guest. After raiding the free samples until I got embarrassed, I ordered a dozen bonbons, packed into two six-piece boxes and bound together. They were everything Napoli said I ought to be looking for. Caramels had a fluidity that seemed to suspend itself when exposed to air or tooth; the sheen on the chocolate was bright enough to reflect light. I’m not one for tea-flavored chocolates, but a delicate jasmine square was enough to make me a convert. As soon as I got back to my car, I tore into a Beernut Bar made with Jack’s Abby lager, salted peanuts, and caramel. It has been a good two weeks since that day. I still haven’t figured out why other candy bars exist. 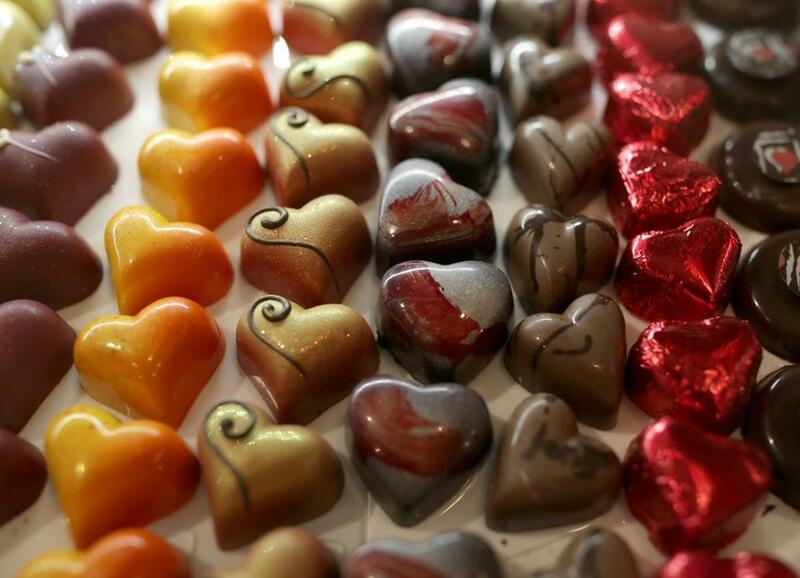 A assortment of heart-shaped chocolates at Beacon Hill Chocolates. 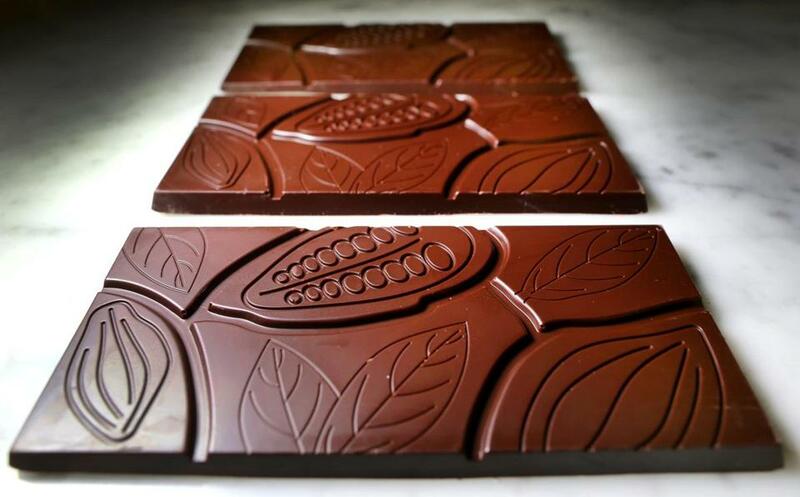 EHChocolatier, 561 Windsor St., B206, Somerville, 617-284-6096, www.ehchocolatier.com. Also available online and through Valentine’s Day at a Kendall Square pop-up shop at 1 Broadway. gâté comme des filles, 14 Tyler St., Somerville (inside Somerville Chocolate inside Aeronaut Brewing), www.gatecommedesfilles.fr. Also available at a handful of shops in Somerville, and at Lizzy’s Ice Cream in Harvard Square through February. Phillips Candy House, 818 Morrissey Blvd., Boston, 617-282-2090, and inside South Shore Plaza, Braintree, 781-356-3800, www.phillipschocolate.com. Also available at some area specialty shops and hospitals. Somerville Chocolate, 14 Tyler St., Somerville (inside the Aeronaut Brewing building), www.somervillechocolate.com. Also available at a dozen or so shops in Somerville and beyond, and at Lizzy’s Ice Cream in Harvard Square through February. Taza Chocolate, 561 Windsor St., Somerville, 617-623-0804, www.tazachocolate.com. Also available inside the Boston Public Market and at many area specialty shops.